The news which is getting hot around us is about the launch of OnePlus next upcoming flagship killer smartphone the OnePlus 5, and now we have enough information to say that the OnePlus 5 is coming very soon. But before we head over, I would like to include here the 10 things you should know about OnePlus Next Flagship Killer smartphone OnePlus 5 from OnePlus. 1- OnePlus 5 Why Not 4? 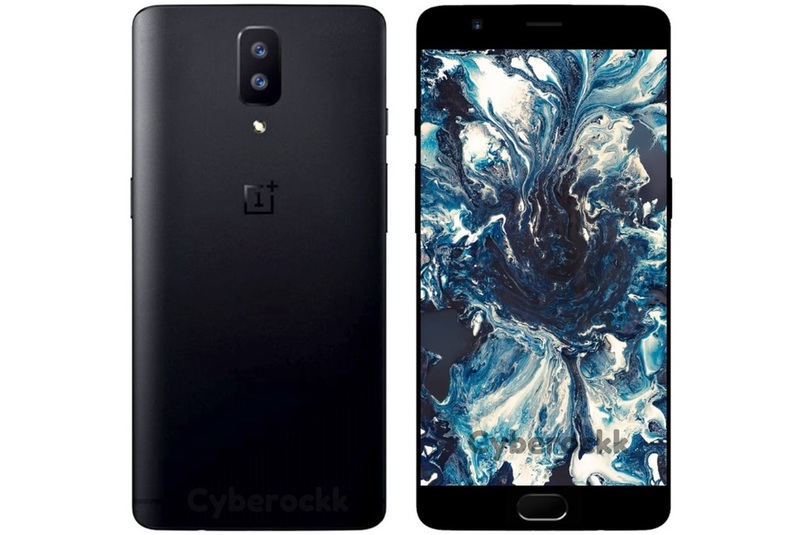 According to a recent confirmation from OnePlus CEO Lau Pete, the company was already working on a new flagship device, a successor of the previously announced OnePlus 3T and the OnePlus 3 which were the phones of the year in 2016. After theses, two devices were launched, several speculations started circulating about what would be the next OnePlus device to be called. According to previous rumors, the company was expected to launch a new flagship device called the OnePlus 4 but that was not true actually. The OnePlus has decided this time to skip the numeral ‘4’ from its next device by naming it as OnePlus 5 but not 4 and the company has pretty interesting reasons for doing this which I have listed below. 1- As per a media report and other speculations, the number 4 is considered to be an unlucky number in China. Hence, with this superstitious belief in mind, OnePlus has decided to skip the OnePlus 4 and directly move on to the OnePlus 5. 3- The company says that several OnePlus employees are fans of the former NBA player Robert Horry whose jersey number was – ‘5‘ and that’s an important reason too on why the company has decided to name the upcoming flagship – OnePlus 5. According to several rumors and leaks on the Internet, the OnePlus 5 will sport a 5.5-inch capacitive quad-HD (1440×2560 pixels) display screen as compared to previously launched OnePlus 3T 1080p Display. The recent confirmed report have suggested that the OnePlus 5 will pack Qualcomm’s latest Snapdragon 835 SoC, 2.35GHz Octa Core Processor. OnePlus 5 is expected to come in two storage variants – 64GB and 128GB internal storage. Just like the earlier OnePlus 3T was launched. According to the confirmed report and earlier rumors, it is now confirmed that the OnePlus 5 will sport 23MP Dual camera setup on the rear and on the front, the OnePlus 5 is likely to come packed with the 16-megapixel shooter. The report suggests that the dual camera setup on the rear will help OnePlus users click better photos in low light as well as offer modes like Portrait and Blur just like we find in iPhone 7 Plus. It is also expected that one of these cameras could sport a telephoto lens, similar to the lenses that we may have seen on the Xiaomi Mi 6 and the iPhone 7 Plus. The OnePlus 5 is expected to come with two RAM variants – 6GB and 8GB of RAM. 6GB for the 64GB variant and 8GB for the 128GB variant. OnePlus 5 will pack a massive 4,000mAh nonremovable battery. But, the difference will be the upcoming smartphone will come with fast charging ability, which will charge OnePlus 5 almost 25 per cent faster than the OnePlus 3T. The smartphone will also feature fast charging support that will charge the smartphone battery 25 per cent faster than the OnePlus 3T. Confirming to The Verge, The Chinese smartphone vendor hinted about the launch of the OnePlus 5 somewhere around this summer but didn’t reveal any exact date for the launch, some other media report have suggested the device to be announced next month in June. 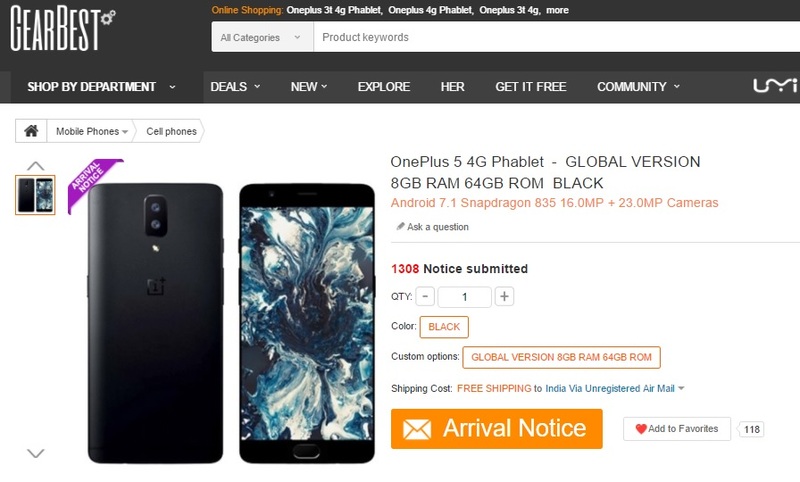 however, a Global Version of OnePlus 5 can be seen listed on GrearBest online store with a black color, 64GB ROM and 8GB RAM variant along with an Arrival Notice button, where you can subscribe to the newsletter to get availability details of the device. As the GearBest listing shows, the device has a price tag of $688 (roughly around Rs. 44,233 INR) which seems double and a title more expensive as compared to the OnePlus 3 and OnePlus 3T prices Rs. 28,000 INR. Another listing from OppoMart showed a price tag of $449 which is roughly around Rs 28,800. However, we can’t be sure about its pricing because the company is yet to confirm the pricing details. That’s it, so what is your expectations from OnePlus next flagship killer smartphone the OnePlus 5? you can share your thoughts with us in the comment section down below.